Thursday, February 14 -- A Happy Valentine's Day for us. 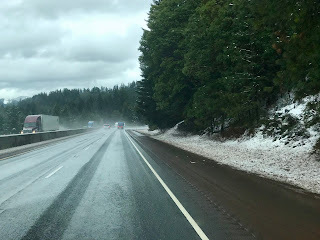 Yesterday, we thought we were going to have to stay a few more days at the Durango RV Resort in Red Bluff before driving I-5 north through the pass between Northern California and Oregon. 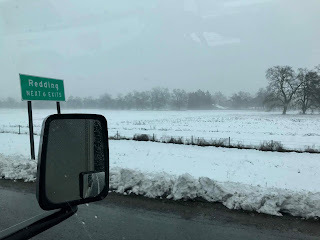 Good thing we stayed in Red Bluff, Redding was snowed in. I woke early and read the weather and road condition websites and apps. I-5 was closed last night, and when it wasn't, chains were required. Early this morning the report was very different. Chain inspections were lifted, and the roadway was plowed all the way through. 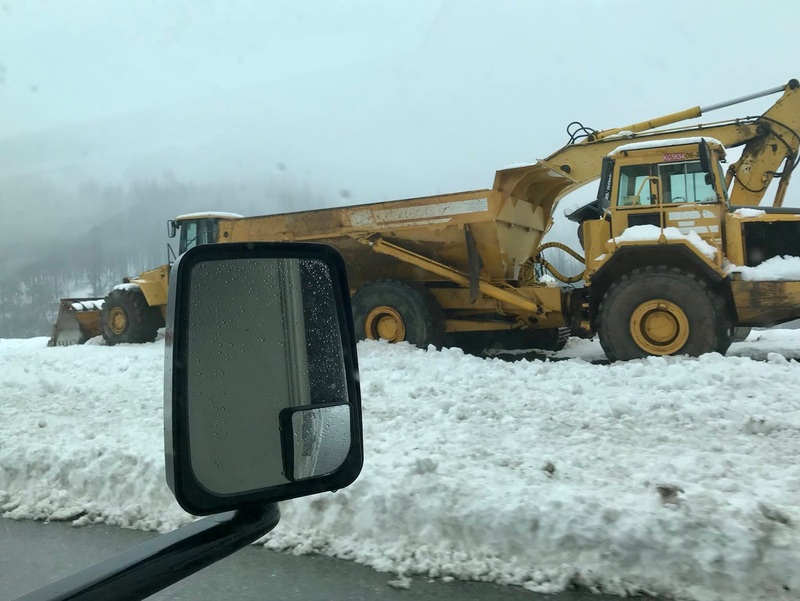 Heavy equipment got I-5 back open in record time. The temperature was warm enough that ice wasn't a problem. There were a few wind warnings along the way, but we decided to give it a try. 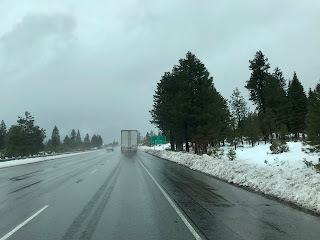 Following "our truck" through the snowiest part of the pass. I wanted to stop in Yreka to visit Linda, my best childhood friend. With snow forecast for tonight, we didn't take the chance. Maybe next trip we will have better conditions. 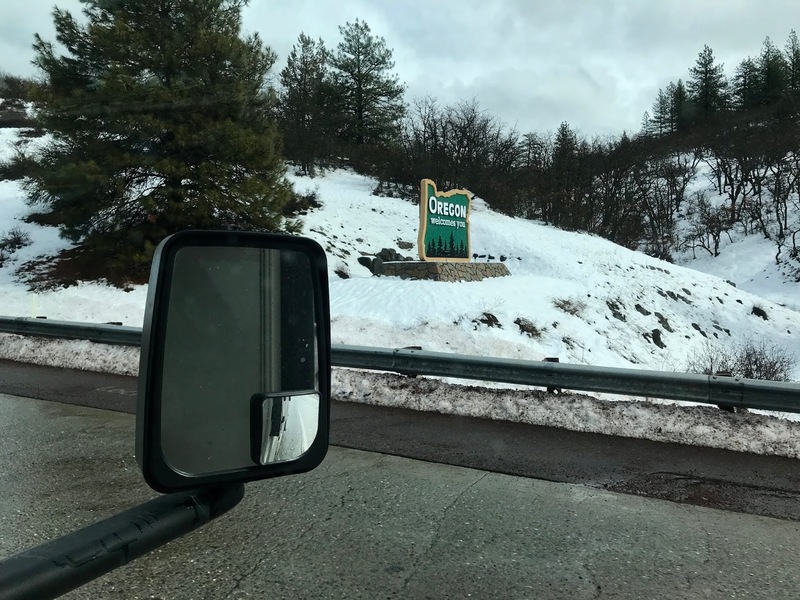 Snow on the Oregon side wasn't as heavy. We made it! Wayne's goal was to reach Ashland without a mishap. 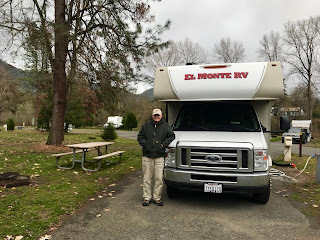 We did that, and finished the day just north of Medford at the Valley of the Rogue State Park. Lots of pull-through sites to choose from. This was the hardest 196 mile drive of our entire trip. 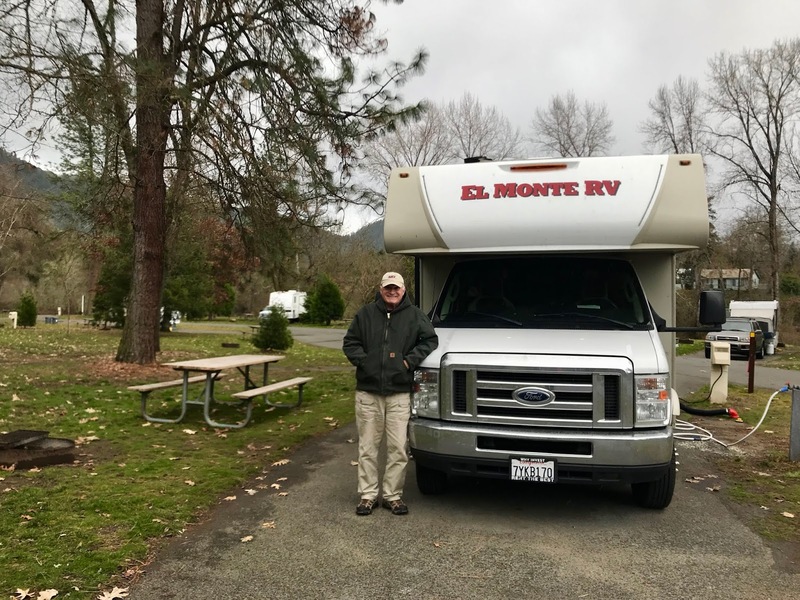 The beautiful State Park with full hookups and the Rogue River roaring nearby lulled us to sleep. 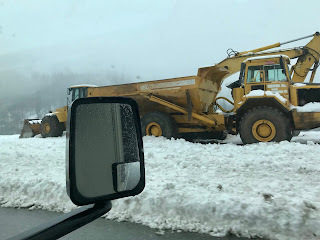 Friday, February 15 -- Now that we've made it through the pass, we can slow down. We woke up to snow, but a rising sun. We fixed breakfast and waited for the roads to improve. 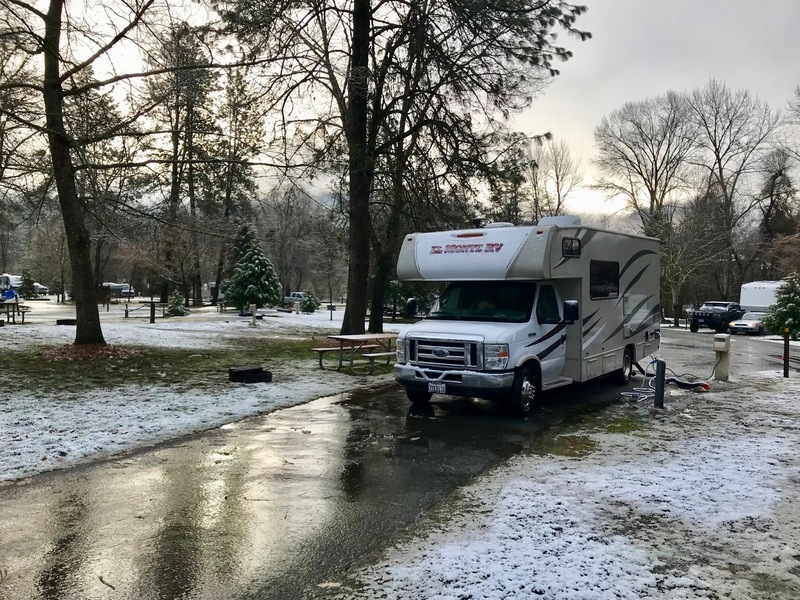 Waking to snow on the ground at Valley of the Rogue. Heading south we didn't notice how many summits there were in Southern Oregon. 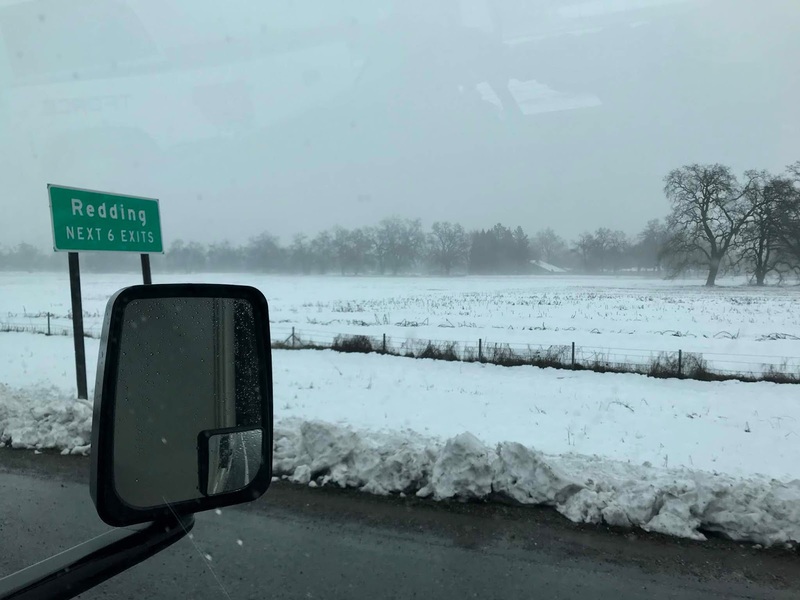 With snow on the ground, it was more evident. Plows and de-icing trucks had everything cleared. Cleared and de-iced roads all the way to the lowlands. Today's destination is Corvallis, Oregon, only 195 miles away. We made a gas and Walmart shopping stop in Cottage Grove. As I mentioned, our propane heater isn't working. We bought an additional electric heater to augment the one we brought. From now on, electricity will be available each night. 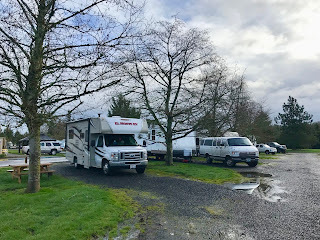 Corvallis KOA just 6 miles out of town. Corvallis is of interest to us because we come here frequently for Oregon State University sports events. 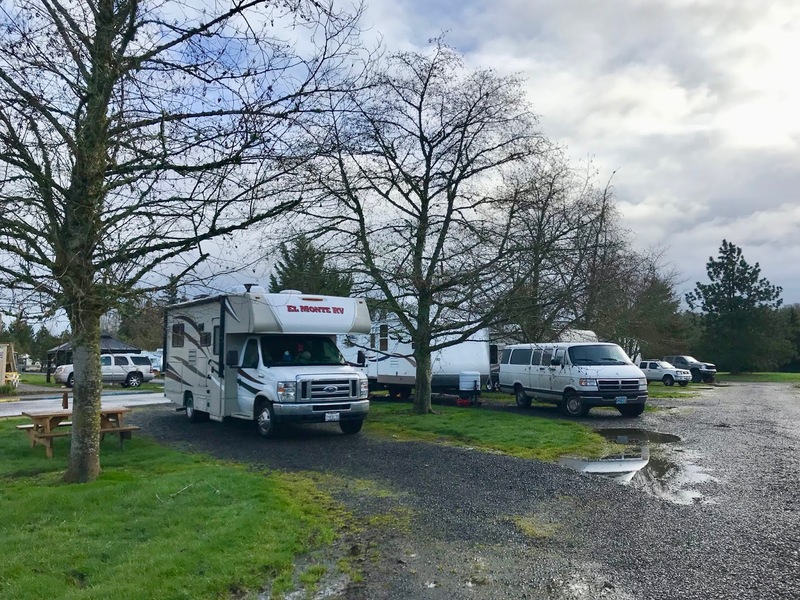 If we do get an RV, the Corvallis KOA would be a good place to stay and use Uber to get to the stadium. 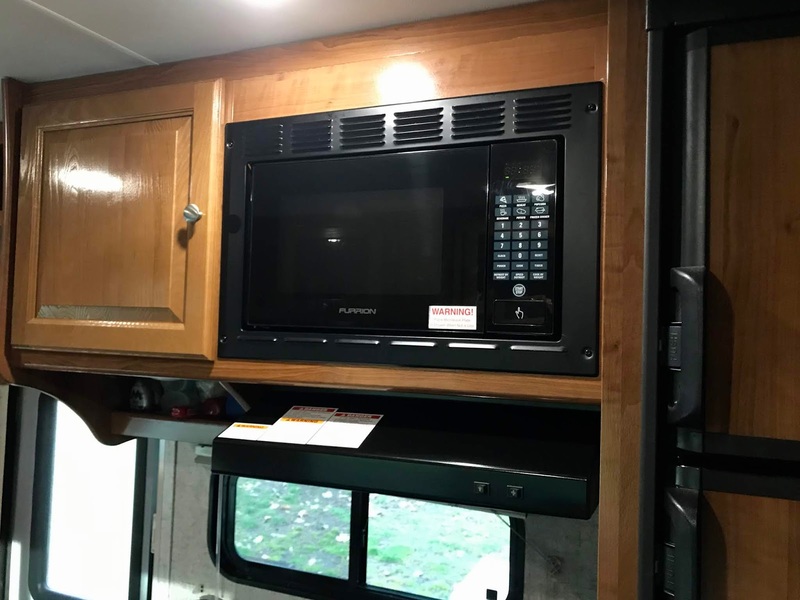 RV Kitchen -- Even a small RV like our 22' Coachmen Leprechaun has a full kitchen. Earlier I shared about our propane refrigerator. Water for the sink comes from a park's city water hookup, or the onboard fresh water tank. Waste water is held in a gray water tank. 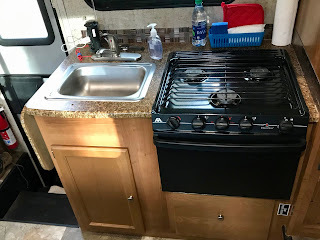 Kitchen sink and propane burners and oven. Propane runs the burners and oven. The onboard tank can be filled at gas stations and RV parks. I love cooking with gas. That's what I have up at the float cabin. Small RV's don't always have an oven. Microwave ovens are more common. While we used our propane oven once, we used the microwave quite often. Being able to fix our own meals is part of the fun of an RV adventure.